In a match notable for the warm, blustery Brisbane conditions which wreaked havoc on the foot-skills of all players, the Lions’ three point win in their first home match will long be remembered for the thrilling running goal kicked by speedster Kate McCarthy. Coming midway through a second quarter in which Brisbane were kicking into the strong the breeze, McCarthy gathered the ball on the defensive side of the wing, sprinted through the centre square and on into the open forward line, taking four bounces along the way. It was a pivotal goal. The former elite junior sprinter burnt off a number of desperate Magpies defenders in the process. Quite apart from being the centrepiece of the match highlights reel, the goal was so important for Brisbane because it came against the run of play; until that moment, Collingwood were pressing hard in their attempt to fight back into the match, having been outplayed for the bulk of the first term. With first use of the wind, the Lions dominated early, but were not able to create sufficient scoreboard pressure. The same was true in the third quarter. This was despite the dominance of the imposing Sabrina Frederick-Traub, who will surely develop into one of the premier power forwards in the competition. She has a deftness of touch – as her goal-creating short pass to her skipper in the third quarter demonstrated – and also pinch-hit in the ruck on a number of occasions. Frederick-Traub’s dominance offered stark relief to Moana Hope, Collingwood’s marquee player. Hope was largely ineffective up forward and looks to be a shadow of the player who has dominated local footy in recent seasons. maybe a run further upfield might be the tonic? Naturally, the paucity of goals meant that the Magpies were never quite out of the game, and to their credit, their battling style of in and under play kept them in the game right until the final siren. The Magpies even managed to outscore the Lions two goals to one into the breeze after the main break, with goals to Jess Cameron and skipper Steph Chiocci (the result of a dubious free-kick right on the siren). Would the six-day break on the back of a long trip home Fremantle tell on the Lions players? The unsettling conditions dictated that the match was tough and scrappy. There were a number of heavy clashes and incidents where a player emerged from a pack nursing an injury. In fact, at one point late in the last quarter, there were three Collingwood players in the hands of trainers at the same time. (To me, this attrition rate made a nonsense of the fact that the clock does not stop for injuries in AFLW). So, in light of the draining conditions and manner in which the match was played, battle-weary Brisbane led from start to finish, demonstrating plenty of pluck against a Magpies team which threw everything at them in the last term. And who other than Kate McCarthy, on the end of a chain of possessions, should pop up again to boot the sealer? Hers is a wonderful story: a player taking to the field with a pacemaker – and at the same time setting a cracking pace. Brisbane: Frederick-Traub, Bates, Zielke, Gibson. 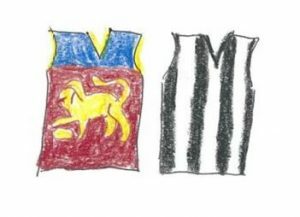 Collingwood: D’Arcy, Tesoriero, Chiocci, Bernardi. 5,500 at South Pines Sports Complex. 3. Frederick-Traub (BL), 2. D’Arcy (Coll), 1. Zielke (BL).